Winner of the 2017 Stella Prize. I pounced on The Museum of Modern Love as soon as I heard about its subject matter: the performance artist Marina Abramovic. Written by Australian author Heather Rose, this blend of fact and fiction centres on those two and a half months in 2010 when Abramovic staged perhaps her most famous work, The Artist is Present, at MOMA in New York. For the duration of the exhibition, Abramovic sat silently in a chair while members of the public were invited one by one to sit opposite the artist for an unspecified period. The apparent simplicity of the piece (although a monumental feat of endurance for Abramovic) struck a chord with many and soon people were camping out overnight for their chance to sit with Marina. The Museum of Modern Love follows the impact of those 75 days from a variety of viewpoints: a composer, a widow, a PhD student, an art reviewer, a ghost, a muse and Abramovic herself. Reaction to art is of course personal and similarly the response to this novel may vary, but I adored it and it is my book of the year so far. 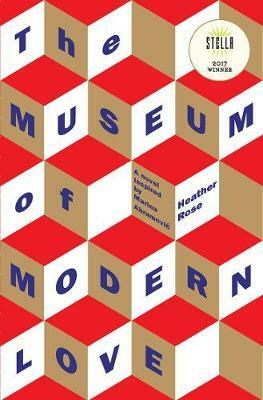 It’s true that the subject matter is fascinating in itself but Heather Rose deserves credit for taking the initial inspiration to create her own thoughtful, multi-layered work; deftly grabbing the reader’s attention right from the beginning and sustaining the multiple narrative threads throughout. The theme of connection is predominant and I found the most significant part of the novel to be how the characters respond to the exhibition and whether they are able to take that experience into their own lives (i.e. truly connect art to life). This is ultimately a book for Abramovic fans (if you need some background try the excellent documentary also entitled The Artist is Present) but also for those who love New York and the arts in general.